One for the science fiction fans! Set beneath the twin moons of the planet Deucalion, this is a story about colonization, exploitation, and revolution. The frontier-like existence on the planet means that large Earth-based companies have done very well exploiting the mineral wealth on the planet. But this has had terrible consequences for the indigenous Elokoi, a peaceful race of telepathic beings. Brilliant young scientist Jane arrives on Deucalion to start work on a genetic project. But she has no memory of her former life on Earth and, by digging for clues about her previous work, she discovers highly secret and questionable research practices. Darryl and 8 year-old Elena are the only survivors of a transporter crash that appears to have been engineered to kill the only viable political rival the planet’s first president has. And the president appears to have a cosy relationship with the large companies. As the narrative unfolds, the details of a vast cover up emerges involving Elokoi and the mysterious Children of Icarus. This story weaves elements of medical ethics, of indigenous rights, and of the uneasy relationship between a colony and the ‘mother’ planet. 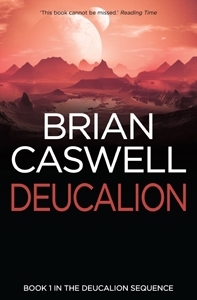 This is the first of a trilogy set on Deucalion. First published in 1995, it was rereleased to coincide with the release of the third in the series, Dreams of the Chosen. The story is told in multiple viewpoints and this makes it difficult for the reader to relate to any one individual, for ultimately it is a tale of the anatomy of a revolution.